While we wait for some Damon Carlton and a Polar Bear updates, we were sent this T-Shirt design from the artist design community "Threadless". The T-Shirt is called "108 Objects from Flight 815" and is by Nathan Pyle. Click Here to go to the web site. "I'd originally set out to create a giant, chalkboard-size differential equation that 'explains' the ultimate mystery of the show, using symbols from the show - a polar bear (minus) fish biscuit (times the square root of ) the lighthouse, and on and on to a tongue-in-cheek payoff I hadn't yet determined - probably something about telling Locke what he can't do. As I drew more and more symbols, I realized the equation was unnecessary and I could make the items into a mosaic. 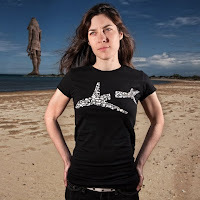 It was so easy because LOST is full of instantly recognizable symbols and physical, tangible things - a broken airplane, a set of knives, a wheelchair, a metal case, the Virgin Mary statues. It wasn't a stretch at all to come up with 108 references - especially because there are so many LOST fans in the Threadless community that helped by using the blog forum to send me suggestions for more symbols. I'm a huge fan of the show - in fact, I work in television, and a dream job would be to work on or write for a brilliant series like this. As I worked on the design, I went back to the very beginning and started watching the episodes straight through again. I'd forgotten how much I love the simplicity of the first few seasons - "Guys, where are we??" - but I also love the added layers of intrigue and mystery with each successive season, and of course I'm sad to see it end. So I hope the shirt (and hoodie) can help soothe the sadness just a little bit and we can carry on in the midst of our impending LOSTless state. In the words of Hurley, "Let's look Death in the face and say, 'Whatever, man!'"